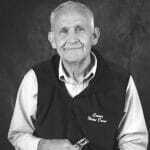 Following in the footsteps of a Hall of Famer isn’t easy, but Tom Alford always kept the words of Virgil Niewohner in mind when he took over as the head of the ticket takers and ushers for Quincy Notre Dame athletic events. There was a soccer game at Flinn Stadium several years ago, and we had just raised the ticket price for a grade school kid from $1 to $1.25,” Alford said. “Well, there was this dad who dropped off his kid and drove away, and when the boy found out he didn’t have enough money, he walked to the fence and tried to watch. I walked over to him and said, ‘Do you like soccer?’ He said yes. I said, ‘Did your dad not give you enough money for the game?’ He said yes. I always remember Virg saying to make sure you get people in and to use your judgment. So I let that boy in, and I’ve always thought that boy will remember that day forever. Tom and his wife, Joyce, were married in 1961, and they had three sons — Alan, Bruce and Scott. They started AA Communications in 1975, and Tom is still involved with the business today. Joyce died on Jan. 1, 2011. I would like to thank the Quincy Notre Dame Hall of Fame Committee for my selection. I am humbled and honored. More than 30 years ago, my wife Joyce and I made the decision to send our children to QND, not only for a Catholic education but also because of the values QND instills in its students. At QND, you are not just a student or parent, but part of a family. Thank you for allowing us to be part of your family. I have enjoyed my years of service here at Quincy Notre Dame. The students who passed by the ticket window more than 30 years ago are now passing by as parents of students here today. Witnessing generations of Raiders grow into adults has truly been my privilege. The friendships that I have made here are invaluable. I treasure the memories of the good times we have had and look forward to the memories of the future. It has been an honor and a privilege to serve the Raiders community, and I look forward to serving you in the future.